You will be given a reference e-book to read which has 206 pages And the test will be based on that e-book , you can take final test within 1 year of purchase. Selenium IDE refers to an integrated development environment which is primarily designed for scripts based on Selenium. This is usually implemented as an extension of Firefox which gives you the opportunity to easily record, debug and edit tests. Selenium IDE also comes with Selenium core which permits you to quickly and easily play back and record tests in the specific environment where you are planning to run them. A lot of experts also define Selenium as a more portable software testing framework which is primarily designed for web applications. It offers a playback or record tool which is a huge help in authoring tests without requiring you to learn a test scripting language. The good thing about Selenium is that it also offers effective test domain-specific language which is extremely useful in writing tests in numerous programming languages such as the C#, Python, Ruby, PHP, Perl, Java and Groovy. The special test scripting language which is primarily designed for Selenium is also capable of providing commands when it comes to performing actions in a single browser and in trying to retrieve data from results page. It allows you to enjoy remarkable features including the record and playback, auto complete feature designed for the most common commands for Selenium, intelligent field selection which uses Xpath, names and ids, set and debug breakpoints, walk through tests, ability to save tests in the form of Ruby scripts, Selenese and any other vital formats and a feature which automatically asserts page titles. The Selenium certification program which you can now access at Brainmeasures is the most suitable online certification course for you if you have longed to gain a more complete understanding about Selenium IDE. This Selenium course from Brainmeasures is guaranteed to offer you the most accurate and updated information about the subject so coming out as a real Selenium expert after completing the course will never become impossible. With the help of this certification course, you can access the company’s impressive Selenium training which covers all the information that you need about the subject including its definition, its history, major functions, vital components, remarkable features and the many techniques that you can use in getting the most out of it. Completing this certification course allows you to reward yourself with a Selenium certificate which is extremely useful in your attempt to improve your career while also increasing the level of your salary because it shows how effective, skillful and knowledgeable you are in the field. How to take advantage of Selenium IDE in recording your first test? How to effectively work with multiple windows? How to effectively work on AJAX applications and their pages? How to effectively save tests? 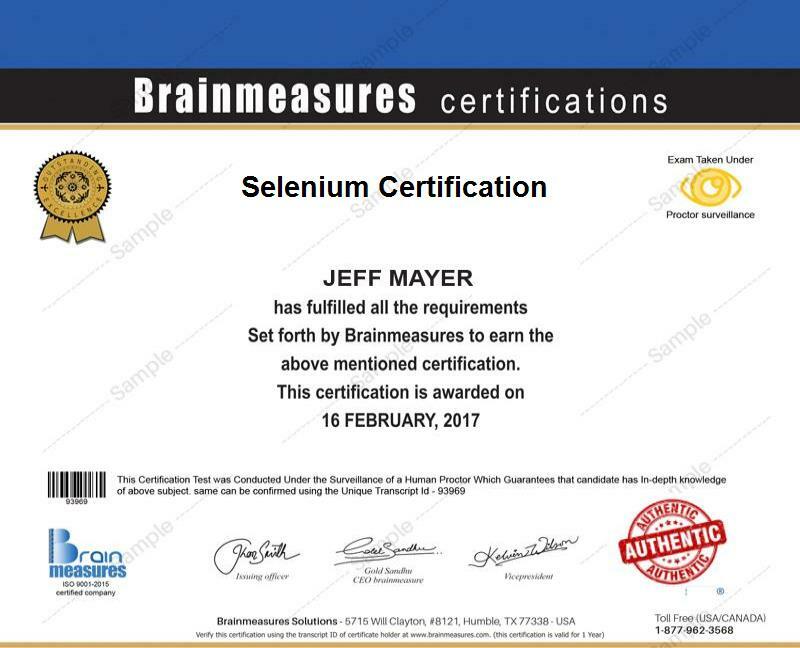 Enrolling in the Selenium certification program which you can now access at Brainmeasures is extremely beneficial to a wide range of individuals and professionals. It primarily targets automation engineers, programmers, developers, QA managers, QA engineers and any other individuals and professionals who aim to understand the major functions of Selenium IDE and effectively perform tests using it. You can also expect to start receiving an even higher pay if you have successfully completed your Selenium certification course. You can take advantage of your Selenium certification by using it to get the position of a Selenium consultant which usually offers an annual salary within the range of $89,000 to $145,000. You can also work as a Selenium test engineer which can reward you with an annual salary of around $97,000 to $175,000.